"A Mediterranean-style eggplant sauce for pasta that can be served with chicken for meat-lovers. Use good quality pasta, cheeses, and fresh herbs for best results. Serve with slivered or grated Parmesan. Serve with a green salad." Arrange eggplant slices in a colander and sprinkle with enough salt to lightly coat; drain for about 10 minutes. Rinse eggplant and pat dry with paper towels. Chop eggplant into cubes. Bring a large pot of lightly salted water to a boil. Cook pappardelle at a boil until tender yet firm to the bite, about 10 to 11 minutes; drain. Heat 1 1/2 tablespoon olive oil in a skillet over medium heat; cook and stir eggplant, adding more oil if eggplant gets dry, until browned, 5 to 10 minutes. Transfer eggplant to a bowl, reserving oil in the skillet. Heat remaining oil in the same skillet; cook and stir onion and garlic until golden, about 10 minutes. Return eggplant to skillet and season with oregano; cook and stir for 1 minute more. Mix tomatoes, vinegar, salt, sugar, and black pepper into eggplant mixture; cover skillet and simmer sauce until eggplant is softened, about 10 minutes. 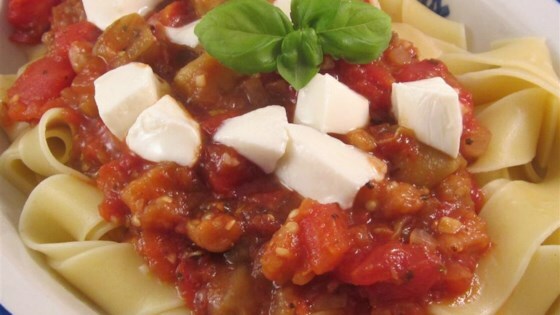 Mix sauce with pasta in a bowl; top with mozzarella cheese and basil. Salting the eggplant in the colander can be skipped, but will ensure that any bitter taste is removed and will reduce the amount of oil absorbed during frying. It's not necessary to peel the eggplant. Substitute 2 tablespoons from oregano for the dried, if desired. Balsamic vinegar can be used in place of red wine vinegar, if desired. Very good! I skipped the buffalo mozzarella and just topped it with shaved Grana Padano®. Delicious! Will be making this again. This was fairly easy to make and super yummy. The hubby and the 6 y.o. were happy, and they requested that I make it again. What a great recipe. I used fresh tomatoes. Everyone loved it! Myself and my three kids loved this meal! My only complaint was that it wasn't saucy enough. I had leftover homemade marinara. Just added the vinegar and some leftover canned mushroom to the sauce. Yum! DELICIOUS! Only things I did differently were based on what I had on hand: different shaped pasta and no fresh mozzarella. Will definitely make this again and again! Absolutely off the scale. Restaurant quality. So glad I found this recipe!